I have a really fun and simple project that would be great for any bathroom. Remember that super long blank wall in the bathroom? Well, I’ve been racking my brain for a fun idea for that wall for 6 long months. With all the white and bright colors, I wanted to shoot for some wood contrast to tone down this room. I also wanted to add some industrial elements to the room. Then, I discovered some cut-offs of lumber Chris had in a pile and the idea hit me, a bathroom towel holders with water valves. 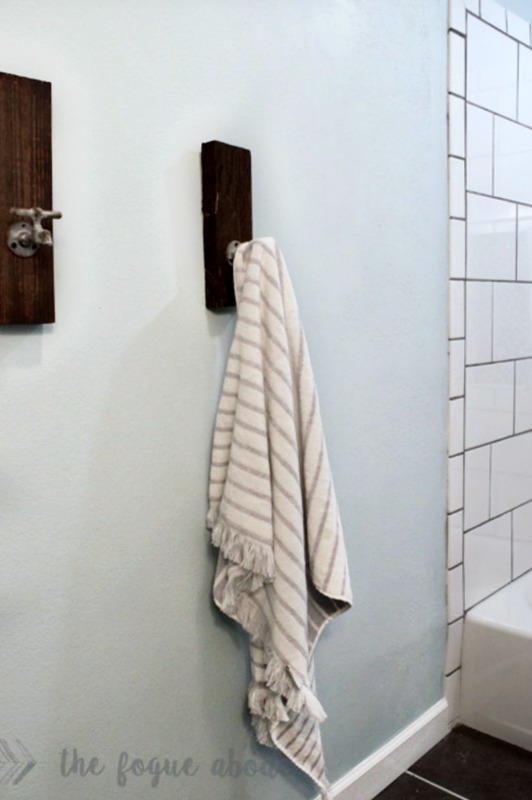 So here is an easy DIY industrial bathroom towel holders that you can create in minutes. When we had our trip to the lake back in April, I was drawn to the different water valves I ventured across. They made really cool subjects for my impromptu photography session. While I was out there, I thought using a couple of different valves as towel holders would be a super cute idea for our bathroom remodel. Once I got back home, I put pen to paper drill to wood and got this project crafted up in about 30 minutes. To start off, I found a few cut-off pieces of lumber lying around from our pony wall install. I purposely picked out the imperfect and odd-sized boards just to give these towel holders some character. Plus, it’s easier to hid screw ups when you intend for them to be different, right? I stained the wood a dark chestnut brown using a Rust-oleum stain, drilled holes for the screws and screwed these industrial water valves onto each board. I used simple brackets nailed to the back to hang them by. Project Total came to $27. 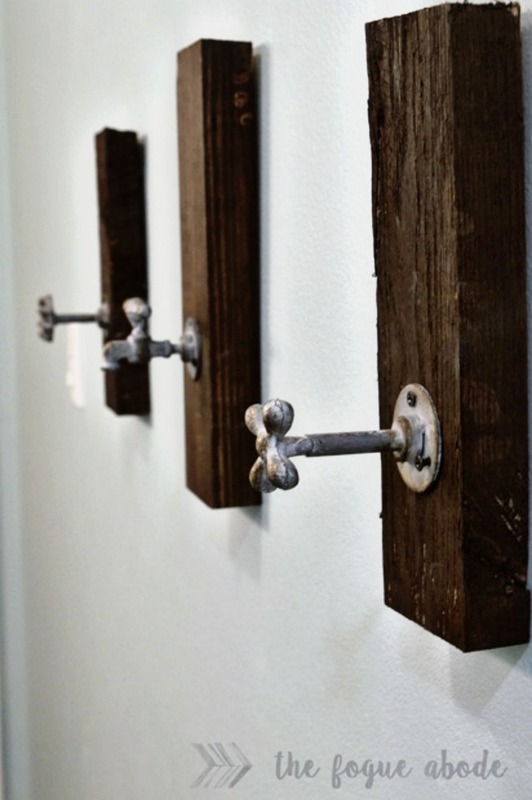 What do you think of these fun industrial bathroom towel holders? I think they make the perfect piece for the long wall up to the shower. It really brings the industrial element to the bathroom I was going for plus these fun water spout valves are super cute for a bathroom.